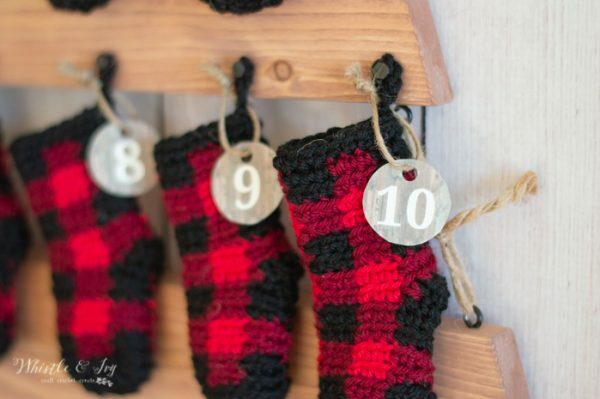 These darling crochet plaid mini stockings make a cute advent calendar! 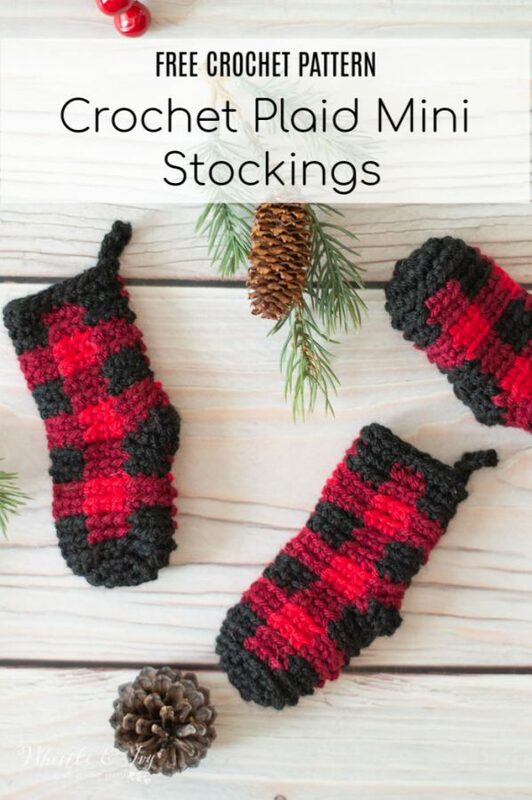 This article includes a free crochet pattern for the cute plaid mini stockings and also a printable for the little numbers (if you decided to turn your stockings into a Christmas countdown). The post also contains affiliate links, thanks for your support. Day Three of Plaid Week has been in the works for a while. First, those crochet plaid mini stockings actually take a bit longer than you think they will (they are so tiny…how?!). Second, I commissioned my woodworking dad to make me a cute wall hanging to hang the stockings from. I also convinced him to set up a listing on Etsy and sell a few. 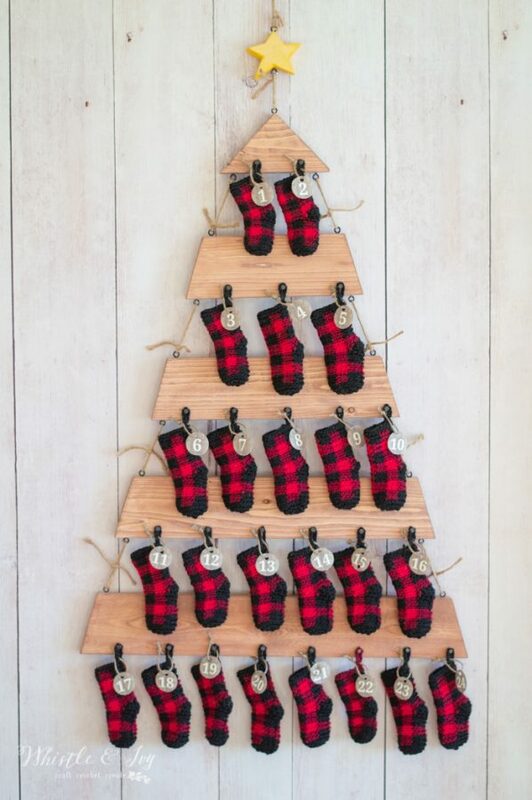 Because this is just a side hobby, he only wants to sell a handful, so if you are interested in getting this cute tree for your mini stockings, hop over and order one quick! They are going to sell fast. 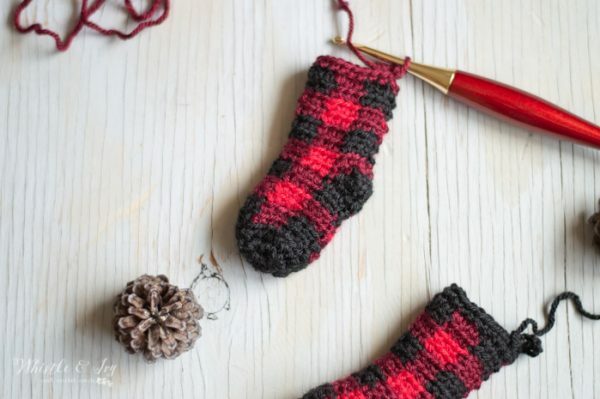 The crochet plaid mini stocking pattern is based on my Mini Stocking Advent calendar from a couple years ago. I changed the counts slightly and made them in the plaid technique. They turn out cute, don’t you think? You could even make them for a garland or to embellish a front door wreath, or even as sweet little ornaments. I also made a simple printable for the little round labels. If you are making an advent calendar with your plaid mini stockings, be sure to download the Stocking Advent Labels. Gauge: Not important, just make your stitches are on the tight side, and use the same hook for all of them. Beginning chain does not count as a stitch. For this project, we will NOT be using the plaid join. You will work the beginning chain, work your first st in the same st as the chain, then work 2 more stitches so your first plaid block will have 3 sc sts. For a cleaner seam, finish the last st of the round with the color of yarn you will be using in the beginning of the next round. 8. – 9. (Work in BLO) With black, ch 1. Work the 3 x 2 plaid stitch all the way cross, alternating between black and wine. Switch to black on the last stitch and join with first st. (18 sts). To prevent extra ends to weave in, we will work a chain and move over to the starting point without have to cut and rejoin the yarn. The chain’s purpose is solely to get you to a new spot about an inch away without having to cut yarn. If you prefer, you can cut your yarn and join it again at the designated place. Continuing where you left off and still using black, ch 4. Take the chain off your hook and insert your hook in the first st of the last block of the previous round (it should be the first stitch of Wine in last the block, 3 stitches to the right of the join). With your hook, grab the chain and pull through to join. Move on to the heel instructions. The next three rows are the heel of the plaid mini stocking. It will be worked by turning. You won’t be going all the way around. Drop black and join wine. We need to move back 2 sts, to do this without cutting and rejoining, ch 3 with wine. Take the chain off your hook. Insert your hook in the 2nd to last st of the heel. Pull the chain through, and move on to round 9. 10. – 17. Work the plaid technique alternating between black and wine, then wine and red in the following row until you reach row 18. Finish each round by joining with the first st.
18. With black, ch 1. Sc in each st around. Join with the first st. Ch 8. Sl st down into the same st to form a loop. Love them? Me too. Be sure to share yours in our Facebook group! Sorry for the confusion! I mean the plaid block will be 3 sts wide and 2 rows tall. (take a close look at the photos to see what I mean). I want to send my Thank You to You for All the crochet Inspiration You So Graciously provide to us! I’ve made several of your patterns! 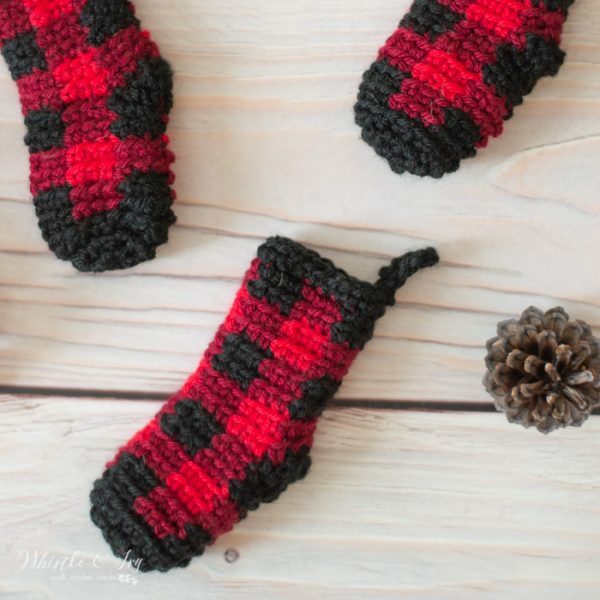 I actually just completed 24 of your adorable mini plaid stockings! I ended up using varied plaid color combinations. Your pattern was easy to follow! I also purchased one of your Dad’s awesome rustic wooden Advent Christmas tree from Etsy. Your stockings and your Dad’s tree are a Perfect pair! You are so very welcome, I am thrilled that you are enjoying your advent. I get comments on my own advent that is hanging in my entry way :) The trees turned out very nice! I’ve made many of your plaid pattern hats, scarves but can’t figure out the heel of the mini stocking. need a video for that one. I intend to! For now, you can look at my solid color mini stocking video. The counts are not exactly the same, but you will be able to see how the heel is worked. I watched the video, the chain 3 and 4 to prevent the tying off threw me off. I don’t want to sound disrespectful of the hard work that goes into these plaid goodies but I only want to make these in solid colors. Would I just skip all the yarn changes and cutting? I want to make some green, white and red ones, but not plaid….although it’s really beautiful!! How many skeins of yarn for each color? One skein of each color.